The Lujiazui Financial and Trade Zone would improve its production-oriented services and provide support for national economic development. The State Administration for Industry and Commerce of the PRC (SAIC) plans to set up a modern enterprise registration system that can better serve the companies in Shanghai. GMAC-SAIC was the first auto finance company approved by the China Banking Regulatory Commission. Situating alongside the Huangpu River, Lujiazui has become Shanghai's financial core and a witness to China's financial booming. The Oriental Pearl Radio & TV Tower is a TV tower in Shanghai. Lujiazui, which literally means "Lu's Mouth", is located in the Pudong New District on the eastern bank of the Huangpu River. 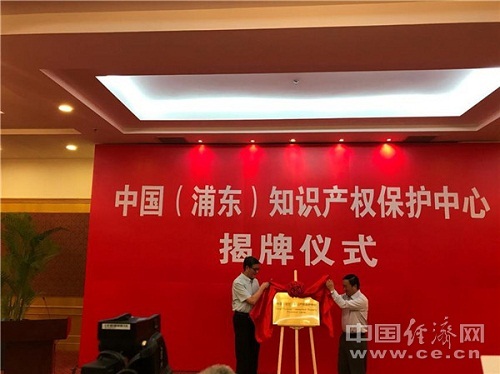 The China (Pudong) Intellectual Property Rights (IPR) Protection Center was inaugurated in Shanghai on July 25. The new center, approved by the State Intellectual Property Office, aims to protect the intellectual property rights of companies in the high-end equipment manufacturing and biopharmaceutical industries. According to Lyu Guoqiang, director of Shanghai Intellectual Property Office, its goal is to develop into a national IPR platform offering comprehensive services such as fast-track patent approvals, quick patent rights verification services, quick rights protection by streamlining complaint channels, counseling about patent, brand and copyright issues, and talent cultivation. Some insiders say that the launch of the center will help many enterprises solve their problems. Patent applications in Pudong's high-end equipment manufacturing industry, which accounts for 38 percent of Shanghai's total output in the industry, exceeded 9,500 in 2016, with 5,200 of those receiving approval, according to government data. Patent applications in Pudong's biomedicine industry, which accounts for 43.7 percent of the city's entire industry, exceeded 2,300, with 1,200 approved. Li Caihui, director of the IPR department of 3SBio Inc, said that it is their mission to develop and produce medicine satisfying patients' clinical needs, and that therefore IPR protection plays a decisive role in the biopharmaceutical industry. Shen Bo, deputy director of the R&D center of Commercial Aircraft Corporation of China, said that their paramount problem is protecting their present technological achievements. He added that the protection center will help reduce the market risks for hi-tech companies in Pudong and even Shanghai, bridge the competitive gap with other advanced companies across the world, and achieve new breakthroughs in key fields.